Directions: Mllican, Oregon is about 22 miles East of Bend, Oregon on Highway 20 towards Burns. Millican has never been a large town. 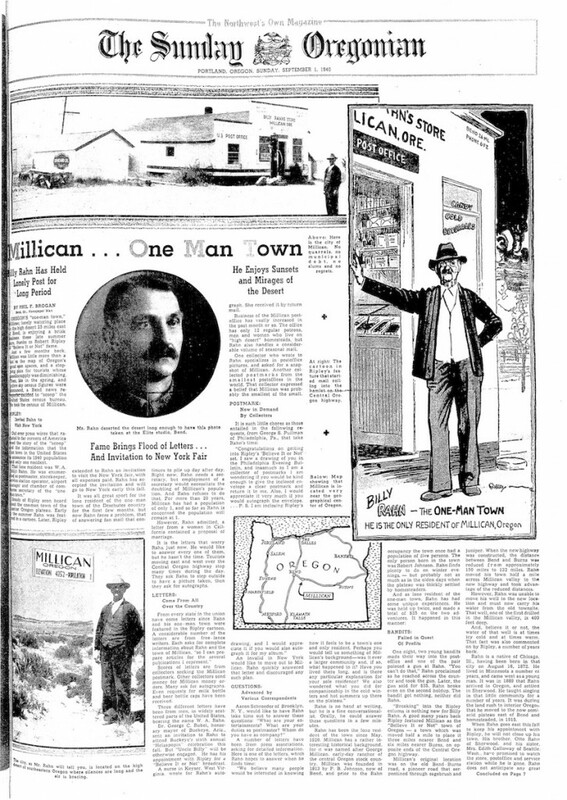 The town was named after early pioneer, George Millican, who came to Oregon 1862. He originally settled along the McKenzie River somewhere east of Eugene. In 1863 he visited the Ochoco area and became interested in developing the McKenzie Pass toll road. In 1868 he established a cattle ranch near Crooked River before moving to the present site of Millican a few years later. He sold the business in 1916, finally dying in 1919. A post office was established in 1913. P.B. Johnson was the first postmaster and suggested Mountain Pine for the post office name. It was declined due to the similarity to LaPine, and Millican’s wife suggested her husband’s name. Unfortunately P.B. Johnson’s son, John H. Johnson died of Lobar Pneumonia while serving in the US Army in World War I. Johnson soon sold his land to J.A. Smith, and someone named Moore became the postmaster. William A. Rahn took over as post master in 1920, mostly because he was the last person living in town. The town lasted this way until October 1930 when the Central Oregon Highway (OR-20) was opened. Rahn moved everything in town to be closer to the highway. 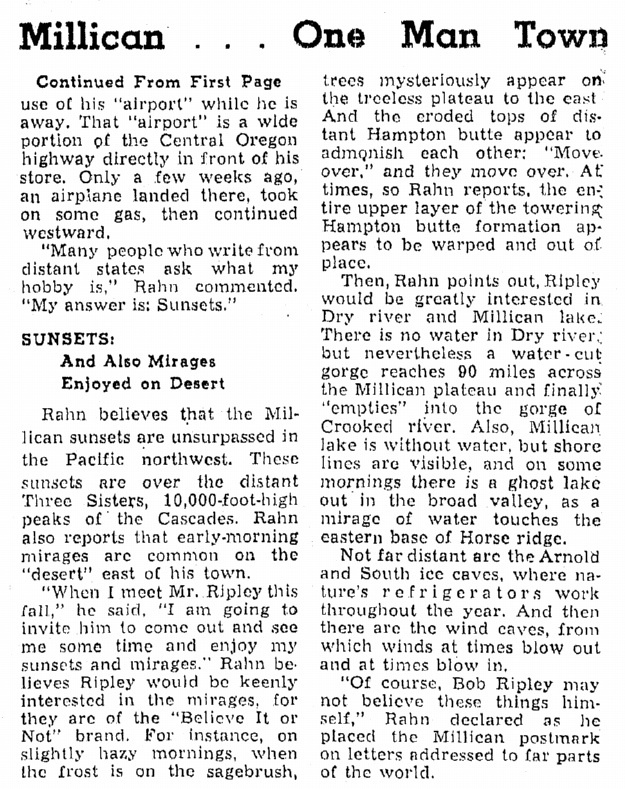 This was a well publicized event in both the local newspapers, and across the United States due to it’s inclusion in Ripley’s “Believe it or not!”. “Billy” Rahn reached retirement age in 1942 for postmasters, causing the post office to close as no one wanted to take over. The town was purchased by Bill Mellin on April 7, 1946. He kept the gas station and store, and managed to reopen the post office. The post office was finally closed for good in October 1953. Mellin put the store and gas station up for sale in the Spring of 1985 but he he was murdered in 1988 before the town could get sold. The estate finally sold the property to Eric Cooper in 1990, but it remains closed to this day.